Several decades ago, Tom Kershaw visited Bermuda’s Hog Penny and was so inspired by it that he decided to open a similar establishment in Boston called the Bull & Finch Pub. In the early ‘80s the producers of a certain TV series were looking for a location for their set. They choose the Bull & Finch. The TV show? ‘Cheers’. The rest is history. Established in 1957 and named after Bermuda’s hog money, this restaurant and pub is located right in the heart of Hamilton. If this was trendy London or New York it would be called a gastropub. It’s small and cosy and has a distinctly British atmosphere. In fact much of the furniture in the pub comes from old Watney’s pubs in England. Wood-panelled walls decorated with old farming implements, intimate nooks and crannies, and antique mirrors complete the effect. For an appetiser you might like to try Garlic Sautéed Shrimp or Duck Liver Pate. Entrees include English pub favourites such as Shepherd’s Pie and Bangers and Mash, Indian curries, cuts of beef, and house specialities like Dark and Stormy Rockfish (pan-fried rockfish with a Gosling’s Black Seal rum and ginger beer sauce). After dinner the Hog Penny becomes a lively pub (although anybody who wants just a drink is welcome at any time). The pub is a bit on the small side and can get extremely crowded with a mixture of locals, expats and tourists. Getting served at the bar appears to be a daunting task but is actually quicker than meets the eye. Beers on draft include local brews from the Dockyard Brewing Company plus imports like Boddington’s, Carlsberg, and Samuel Adams. During the summer months there’s nightly entertainment almost every evening. Live music in 2013 is provided by Will Black. The Canadian singer plays from a repertoire of his own material and 500 popular rock songs. The pub also hosts music trivia and open mic nights. The pub is open 7 days a week from 11.30 am until 1 am. Lunch is served between 11.30 am and 3 pm, and dinner from 5.30 pm to 10 pm. For details of what’s on and special offers visit the official Hog Penny Facebook page. 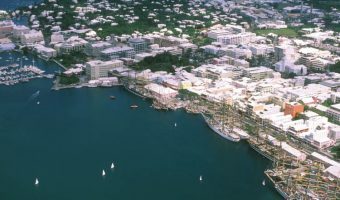 The Hog Penny is one of several establishments in Bermuda owned by the Island Restaurant Group. The others are the Barracuda Grill (upstairs from the Hog Penny), Pickled Onion, Victoria Grill, and the Frog & Onion (at Dockyard). Map showing location of Hog Penny. The fish chowder was excellent and beer good too. A couple of the staff had a bit of an attitude though. The prices were ok for Bermuda. I had fish chowder and burger and both were exceptional. The bartender was a great guy too. The pub was very nice and had good beer. Prices were quite reasonable and we enjoyed the live music. Hog Penny is a great place to go for a Dark ‘N Stormy! Every time we go to Bermuda, that’s where we end up at night – Will Black’s show is great! Can’t wait to get back there again. I celebrated my 50th birthday at the Hog Penny. The food was fantastic and the staff most pleasant. The fish chowder is the best. Came in from NY on a cruise, August 2010. Outstanding Fish Chowder. Fill it with dark rum. Best money can buy! The hog penny is a great pub. Good food, good service, and good prices. Try the sea food. My husband and I never leave Bermuda without going to The Hog Penny. The food is great. Best chicken pot pie and the chef was nice enough to give me the recipe. Great English Pub. A must see! March 2009. Not recommended! Expensive for what you get and the food is so-so and small portions. If you expect bread, forget it! They will charge you. If you want the pub atmosphere go there for a beer. The Hog Penny is pretentious. The food is good, but overpriced. Every time we vacation in Bermuda we have dinner at Hog Penny. It’s one of our favorites. We love the atmosphere, food, and service and the people there are really nice and laid back about everything. The dark wood decor is wonderful. The Hog Penny is the one pub that locals consistently rave about – food, drink, and ambiance – despite the fact that the crowd is usually is about half tourists. It’s just a fun place. Hog Penny is, by far, the best place I have eaten in Bermuda. Great food, great prices, and excellent staff. Great food and greater entertainment! Come down and catch Will Black’s show at night. He rocks! I have been visiting the Hog Penny since the 70’s. It’s got a nice pub atmosphere and I have never been disappointed by the food. The entertainment can be fun also. The seafood chowder here is excellent. If you want to come here when the cruise ships are in I’d advise making a reservation. It gets very busy. You can always try the Barracuda Grill upstairs if you can’t get a table. It’s got the owners.